About 50 University of Oregon students and scholars gathered at the law school Thursday, Jan. 22, to hear newly re-elected Oregon Gov. John Kitzhaber discuss his own political roots as well as his hopes for an historic fourth term. Kitzhaber spoke about the ideal role of state government as well as inequality and opportunity in Oregon. He touched on many of the same issues he addressed during his fourth inaugural address. The event was held in a lecture hall filled with Wayne Morse Scholars, PathwayOregon scholarship recipients, political science students, professors and media. Interim UO President Scott Coltrane provided the introduction. “As we know, higher education is all about opportunity,” Coltrane said, echoing the governor’s theme. Kitzhaber said he “grew up in an era where people still believed in their government.” He described it as an era where a sense of community and a common purpose motivated people to leave a better world for generations to come. His desire to enter the realm of politics stemmed from the example set by his hardworking parents — both members of “The Greatest Generation”— and the inspiration he received from Robert F. Kennedy’s 1968 presidential campaign, which was driven by the same overarching problem many see in the nation today: inequality. Growing economic disparities and widespread inequality across the state have dampened the optimism of Oregonians, he said. He attributed the inequity to a number of reasons, both economic and political. His underlying message, though, was to put aside differences and engage in community. Kitzhaber went on to list several statistics that emphasized the negative circumstances in which many Oregonians have found themselves in recent years. He asked students why poverty runs rampant among minority groups and why so many children in Oregon face food insecurity on a daily basis. “Most importantly, why is that acceptable to us?” he asked. The governor ended on an optimistic note, however. He hopes his fourth and final term will be spent bridging the gaps of inequality in Oregon and continuing the process of fostering a common purpose between all Oregonians. 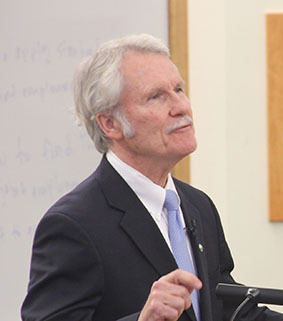 After his speech, Kitzhaber answered questions from students. In his answers, he reiterated his belief that although the language of legislation is important, it is the implementation of new laws that will really make a difference in Oregon. Around the O is the UO’s go-to place for information about the university, its people and the difference they make in Oregon and around the world. We bring stories of the university’s groundbreaking research and world-class faculty and students to the broadest possible audience, while also serving as the hub for news, announcements and information of interest to the campus community.